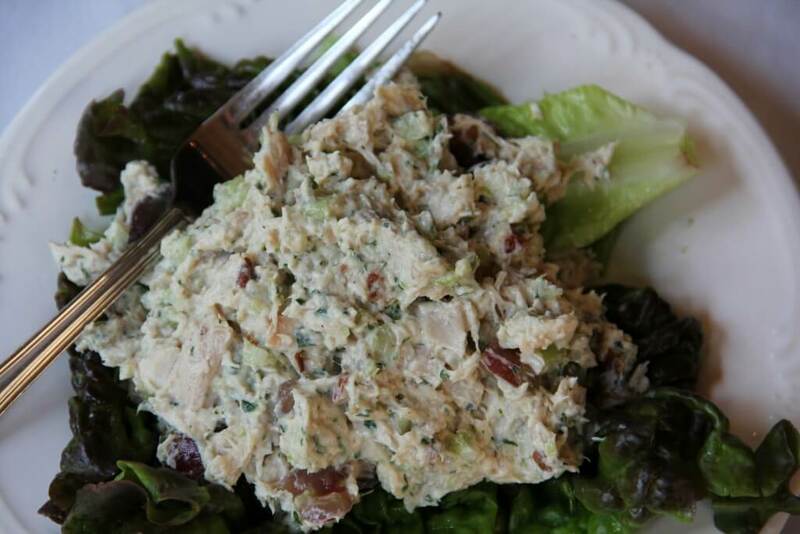 The best Chicken Salad with grapes, pecans, celery and a tangy mayo and sour cream dressing! This Chicken Salad will have your guests asking for more! Years ago, several ladies of my grandmother’s and mother’s acquaintance used to hold monthly meetings which they called UDC meetings, at which someone would read something, they would all discuss whatever it was that was read, and then everyone would commence to eating. A lot of laughing, talking and gossiping also took place. I got dragged along to these meetings because I was too young to stay home alone, but I didn’t mind so much because I got to play outside during the boring reading part and then come in and participate in the eating part. These mysterious meetings were actually gatherings of the United Daughters of the Confederacy. I have no idea what they read or talked about, but would assume it was maybe the contributions various ancestors had made to the Confederacy. But the food…oh, the food…pound cake, dainty finger sandwiches of pimento cheese and chicken salad, cheese rings, decadent dips, petit fours…all sorts of interesting foods and delicacies that were never served around our house. I particularly loved the lemon pound cake made by a lady whom I called “Ma” otherwise known as Mrs. Dorothy Guest. I also loved the chicken salad sandwiches…just a bit of chicken salad between two pieces of white bread, crusts removed and cut into four squares. I would hold my pinky up like I had seen ladies do on television and try to make that tiny sandwich last for more than two bites. Many years have passed since I’ve attended a UDC meeting, but the memories linger of those dear ladies and the wonderful foods they prepared. As with most “meetings” these were more social events and an opportunity to gather together and talk about life and of course, to eat. 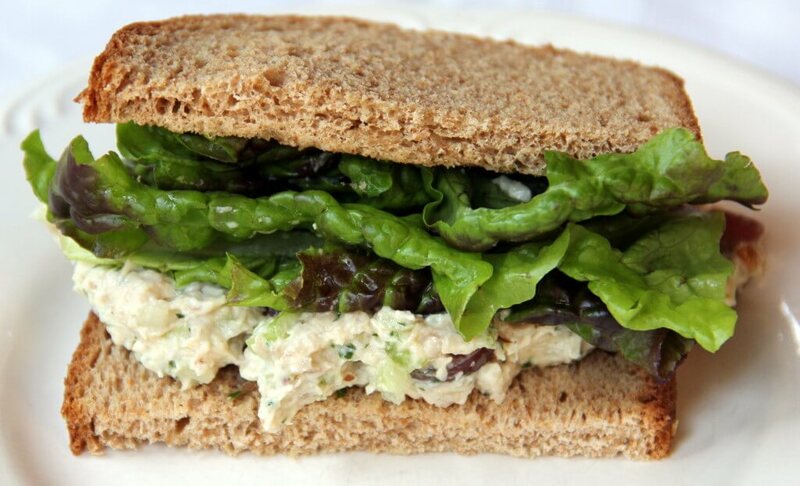 My chicken salad is a little more chunky and wouldn’t work well as a dainty sandwich filler. However, it’s great as a snack or quick lunch for a hungry husband and keeps for several days in the refrigerator. It’s also perfect as a bridal shower salad served in little tart shells. This chicken salad recipe calls for chopped grapes and pecans, which could easily be swapped out for apples and walnuts or other fruits and nuts. Pecans – buy in bulk and keep in freezer! I start with a whole rotisserie chicken or a whole chicken that I’ve roasted, or even 3 or 4 roasted chicken breasts—basically, whatever I have on hand. 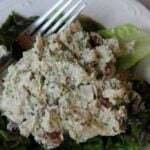 **Cook’s Tip: You can buy a couple of rotisserie chickens or make shredded crockpot chicken and keep it in the freezer for recipes like this homemade chicken salad. So easy to thaw and chop for the recipe! **Cook’s Tip: You can also boil the chicken, but I think roasted has much more flavor. Stir together mayonnaise, parsley, lemon juice and salt and pepper in a large bowl. **Cook’s Tip: I add a couple of tablespoons of sour cream or yogurt for tanginess if I have some in the fridge. Chopping the chicken for chicken salad is really personal preference. I chop it pretty small, but a lot of restaurant chicken salads are chunkier. I like the celery chopped very fine and the grapes quartered. 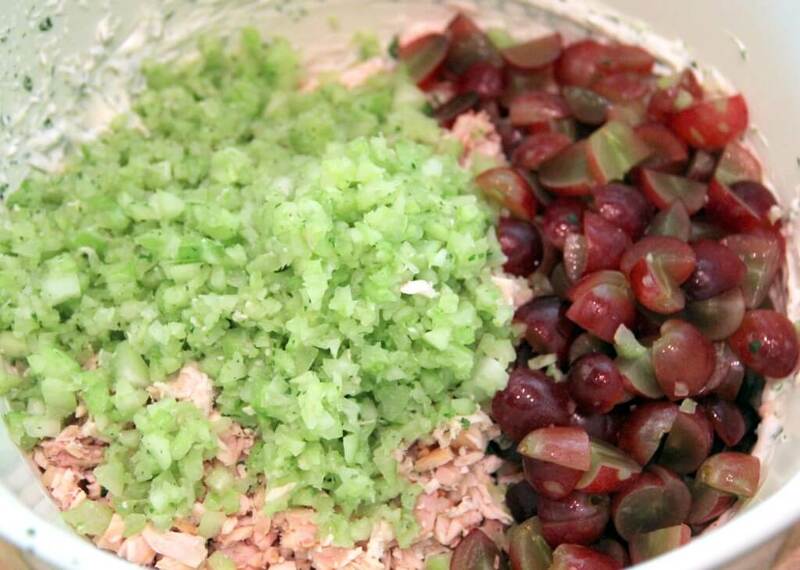 Toss the chopped chicken into the bowl and add celery, grapes, and pecans. Stir it all together and you’re done and have enough chicken salad to make lunches for several days. Use Duke’s mayonnaise to get the best flavor and add a little sour cream. Add some crisp, fresh lettuce to your sandwiches for extra flavor and crunch. This recipe works great in frozen phyllo tart shells. A flavorful, chunky chicken salad fit for company or simple lunches. Whisk together mayonnaise, sour cream, parsley, lemon juice, salt and pepper in a large bowl. Add chicken, celery, grapes, and pecans. 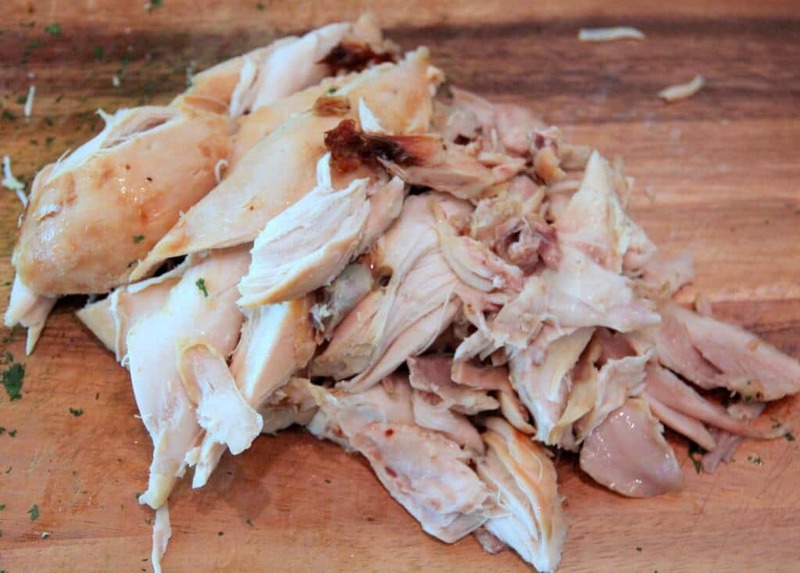 Use a rotisserie chicken for the best flavor and to make it super easy! Be sure your ingredients are fresh: lemon, parsley, celery. Duke's Mayo has the best flavor IMO. I love adding grapes to my tuna, chicken and tofu salads…purple grapes look so beautiful in these dishes and I am so happy to see you’ve added them to this recipe. Love it! Exactly — although it can be hard on the waistline!